Get original value for your money when you purchase the Value For Money Bundle on Konga. Saisho Electric Hot Plate is easy to use and can be used to prepare all kinds of food. 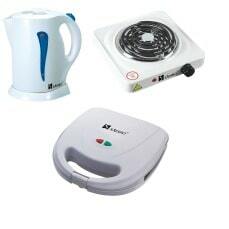 Unlike other hot plates, this hot plate has a sealed hot plate design to prevent any form of electric shock. The body is well coated to protect it from rust and other thing that will not allow you get value for your money. This compact hot plate will keep your kitchen clean without leaving any black soot. It has a knob that gives you the freedom to set the temperature of the cooker to the desired level. This will ensure that your food never gets burnt. The Saisho Electric Hot plate has a durable, compact design and it has incredible features that will help cook your food faster and cleaner. It has an indicators that lets you know you when the hot plate is on and ready. It has a portable design that makes it easy to store after every use hence freeing up space in your kitchen. It is ideal for students, bachelors and for people who need a faster and more efficient way of cooking. The Saisho HP-9 comes in a stylish shiny body design that makes it easy to clean after use. Saisho electric Jug S-403 will help you boil water anytime you need. It is very fast and energy efficient, it takes few minutes to boil water. This is an essential kitchen appliance for every home, as it allows you to grab a cup of tea while getting ready for work or a cup of coffee in the office between meetings. It has a detachable cord which makes it easy to store up. It has been designed in a way that water does not spill from the jug; it is possible with the help of a non-spill spout of the jug.